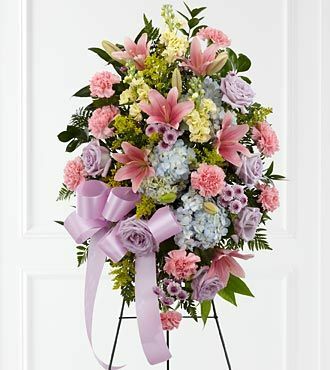 The FTD Blessings of the Earth Easel is a soft and serene arrangement that elegantly honors the life of the deceased. Lavender roses, pink carnations, pink Asiatic lilies, blue hydrangea, yellow stock, lavender button poms, solidago and lush greens are beautifully accented with a lavender satin ribbon and displayed on a wire easel to create a gorgeous display for their memorial service. Approximately 36H x 20W. You save over $7 at FlowersFast! (Compare to FTD retail price: $199 + $22.98 for same-day delivery.) You get the same quality, at a lower price! No extra charge for same-day delivery. FREE personalized gift message included. (Extra delivery charge for Alaska and Hawaii) Same-day florist delivery is available for this item, for orders placed before Noon in the recipient's timezone. Please see the Ordering and Delivery Information.